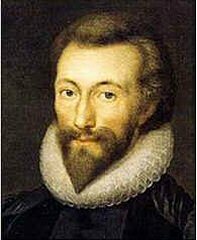 John Donne (pronounced Dun; 1572 – March 31, 1631) was a Jacobean metaphysical poet. His works include sonnets, love poetry, religious poems, Latin translations, epigrams, elegies, songs, and sermons. Donne is considered a master of metaphor, capable perhaps more so than any other poet in the language, of finding brilliant connections between dissimilar things. This set Donne and his fellow metaphysical poets apart from the prevailing verse of the time. Literary style had depended since Chaucer, on a stock of common and (by that time) clichéd metaphors borrowed from medieval and classical sources. Instead of relying on cliché, Donne found utterly novel and striking expressions for love, doubt, faith, and agony that today remain astoundingly fresh. Later in life, after the death of his wife, Donne became deeply interested in matters of faith. He wrote powerfully from his faith experiences, portrayed at its zenith in the religious poems of his late career. Donne was born in 1572 and raised in a Roman Catholic family. His mother was the youngest daughter of a popular playwright, and a direct descendant of Sir Thomas More. His father was Welsh and came from a long line of wealthy merchants. When he was four, Donne's father died, and his mother remarried shortly thereafter. At age 12 Donne attended Oxford for three years, and then continued his studies for an indeterminate period of time at Cambridge, though he received no degree from either institution because, as a Roman Catholic, he was unable to swear a required oath of allegiance to the Protestant Queen. As a young man Donne was a jack of many trades. He traveled to Spain and Italy; he practiced law for a brief time; he was a secretary, theologian, and privateer, during which time he set out with Sir Walter Raleigh on an expedition to capture Spanish treasure galleons in the waters off the Azores. Donne finally settled down with a niece of one of his employers. Their marriage would, however, provide Donne with no great stability; the parents of his wife, Anne More, disapproved so much of the engagement that they had him imprisoned and dismissed from his job; he would spend the next ten years struggling to find a living, while at the same time fathering 12 children. During these hard times, however, Donne would continue to study and write obsessively, particularly hymns, love poems, and theological treatises. Donne's friends urged him to consider a career in the church, but he refused, thinking himself unworthy. It was not until 1614, when King James rejected his appeal for a position at court and stated that he would only offer Donne an appointment in the clergy, which he would finally acquiesce and take holy orders. Donne was immediately appointed dean of St. Paul's Cathedral, and modest financial success would follow, but sadly, his wife Anne died shortly thereafter. The blow was devastating to him, and Donne's poetry and sermons make a marked turn away from the lighter love poetry of his youth, towards poems of deep reflection and spirituality. Donne would also write his greatest sermons during this time, and eventually be acclaimed as the foremost preacher in all of England, becoming a favorite religious adviser to both Kings James and Charles. On Feb. 25, 1631, Donne left his deathbed to give a final sermon, "Death's Duell" (sic. ), a meditation on the dissolution of life that is often considered to be his own funeral sermon. He died a few weeks later, and was buried in St. Paul's, the cathedral in which he had worked for so many years. Around the time Donne married Anne More he produced what may be the first of his mature works, the "Anniversaries": An Anatomy of the World and Of the Progress of the Soul. These poems revealed his faith in the medieval order of things, which had been disrupted by the growing political, scientific, and philosophic doubt of the times. These poems, and those written during this middle period, do not have the power of the later poems such as the Holy Sonnets, but they reflect Donne's faith in tradition, a faith that would be fully realized in the religious poems of his late career. In addition to poetry, after his ordination, Donne wrote a number of religious works, such as Devotions Upon Emergent Occasions (1624) and various sermons. Several were published during his lifetime. Donne was regarded as an eloquent preacher, using his style to become known as one of the greatest preachers of the era. John Donne is considered a master of the conceit, an extended metaphor that combines two vastly unlike ideas into a single idea, often using imagery. Unlike the conceits found in other Elizabethan poetry, most notably Petrarchan conceits, which formed clichéd comparisons between more closely related objects (such as a rose and love), Metaphysical conceits go to a greater depth in comparing two completely unlike objects. One of the most famous of Donne's conceits is found in "A Valediction Forbidding Mourning" where he compares two lovers who are separated to the two legs of a compass. Donne's works are also remarkably witty, employing paradoxes, puns, and subtle yet remarkable logic. His pieces are often ironic and cynical, especially regarding the motives of humans and love. "No man is an Iland, intire of it selfe; every man is a peece of the Continent, a part of the maine; if a Clod bee washed away by the Sea, Europe is the lesse, as well as if a Promontorie were, as well as if a Mannor of thy friends or of thine own were; any mans death diminishes me, because I am involved in Mankinde; And therefore never send to know for whom the bell tolls; It tolls for thee." This page was last modified on 15 May 2018, at 19:43.